Nicotine replacement therapy (NRT) has become a central part of the treatment of nicotine dependence. 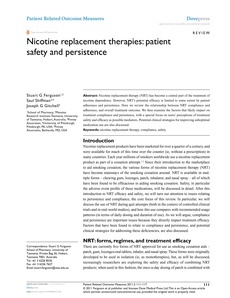 However, NRT’s potential efficacy is limited to some extent by patient adherence and persistence. Here we review the relationship between NRT compliance and adherence, and overall treatment outcome. We then examine the factors that likely impact on treatment compliance and persistence, with a special focus on users’ perceptions of treatment safety and efficacy as possible mediators. Potential clinical strategies for improving suboptimal medication use are also discussed.